Another stingray fishing thailand trip to the Maeklong River saw the Fishsiam team once again fishing for Giant Freshwater stingrays. Timing the trip to coincide with the early morning tide the anglers were soon positioned on a wide section of the river with baits in position. Fishing at a new area slightly further upstream the anglers had to contend with rafts of floating vegetation being pushed upstream by the invading tide. After several gentle takes which did not develop into runs it was apparent that Giant freshwater stingrays were in the area. As the tide began to edge up the water levels it did not take long before a run developed on a bait fished in mid stream. On winding down into the unseen Giant freshwater stingray a light thumping could be felt on the rod tip of the 130lb class stand up rod. The Giant freshwater stingray was clearly only a small specimen and was duly winched to the surface in under five minutes. On breaking through the surface layers the Giant freshwater stingray was tightly grabbed by the spiracle and quickly pulled into the boat. The Giant freshwater stingray on this occasion was identified as being a small male of a mere 10kg’s and was quickly retained at the riverside for later scientific examination. With several crushed baits retrieved indicating the presence of small stingrays a decision was made to move slightly downstream. On arrival baits were positioned and the anglers waited patiently for more action to come to the rods. With the tidal river now at its highest point one of the baits was picked up by an unseen freshwater stingray. Winding down into the stingray saw the rod bent over towards the surface of the river nodding gently as the Giant freshwater stingray moved away with the bait. A short ten minute battle ensued which indicated the Giant freshwater stingray was not a particularily large fish. After prying the stingray off the bottom on two occasions the Giant freshwater stingray was brought up into mid water where it languished for several minutes before being brought to the surface. After netting the stingray on the first attempt the stingray was identified as being a male of an estimated 35-40kg’s and quickly placed in a net at the riverside for later inspection. With still almost an hour of fishing left the anglers returned to the same position and dispatched baits into the depths. Almost twenty minutes passed before a much larger Giant freshwater stingray picked up one of the baits. The battle on this occasion lasted fifteen minutes and saw the unseen river monster clamping onto the muddy riverbed in an effort to evade capture. The monster stingray was prized off the bottom on several occasions before it could be brought into the relative safety of mid water. After slowly pumping the Giant freshwater stingray to the surface with the heavy duty stand up outfit the stingray was quickly dragged over the knotless net before being transported to the riverside. 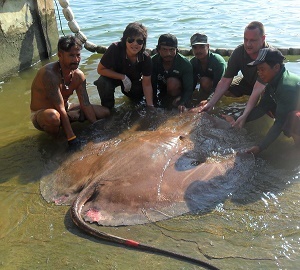 On arrival at the riverside the Giant freshwater stingrays were examined by the Chulalongkorn University research team who quickly discovered that the last Giant freshwater stingray caught which was estimated to weigh 100kg’s was showing signs of pregnancy.